Another “People are Awesome” compilation, this one with a good deal of high-def shots and slow-mo, to truly appreciate how awesome these feats are. Full screen button doesn’t seem to be available, so click the You Tube button lower right and you can then see it full screen on YouTube.com. A stuffy nose that just won’t go away? Don’t blame a lingering cold. Think allergies instead. Nearly a third of Americans, and hefty numbers of people in other countries, are allergic to dust mites (really, it’s their droppings, but we’re not going there), which live inside your pillow and mattress and other stuffing-filled places you’ve spent time. And in winter, when your home is all sealed up to keep heating costs down, your Kleenex costs are likely to rise — along with your chances of a bad night’s sleep as well as an increase in your risk of asthma, eczema, or chronic sinusitis. The first step in treating allergies is limiting your exposure to them. Avoid clutter and dust and mite-poop catchers — knickknacks, drapes, stacks of books, papers, or toys — especially in the bedroom. Bare your floors (and damp mop them frequently). If you do have carpet, vacuum often, and clean under the furniture and in closets. Use only polyester pillows, and frequently wash them — and all bedding — in very hot water (130 degrees Fahrenheit). For extra protection, zip mattresses, box springs, and pillows in allergen-proof coverings that block particles of one micron or larger. If you have a forced-air heating system, change the filters monthly. Cold and warm air ducts should be professionally cleaned at least every 4 to 5 years. Use an air cleaner with a HEPA or electrostatic filter. If you get symptoms during housecleaning, wear a mask over your nose and mouth while doing chores. Better yet, have your spouse do the cleaning! I really like almond milk.. actually prefer it on my (whole grain!) cereal. But what I am BUGGED about is trying to find an almond milk without carrageenan, a seaweed-based thickener which is often used in commercial almond milk (to read why it is best avoided, read Dr. Weil’s article here). So imagine my delight when friend Peggy H. told me she has been making delicious almond milk, and it is a SNAP. Ingredients? Almonds and water. Throw in some honey, stevia or dates as a sweetener should you prefer it sweetened, and/or a bit of vanilla extract if you like that taste. I made my first batch this week and, Yay!. Love it! And because you thankfully use zero preservatives, keep the batches on the small side… it only lasts 4-5 days. Ya… so about that “end of the world” thing looming in a few days…. Just in case you want to cover your a•• on this, you might want to check out a few likely scenarios. Tuck some supplies near the tree (or in the bottom of your own Christmas stocking) so that when someone inevitably opens something with a cable or charger, it is immediately labeled for future reference. Labeled zip-loc bags to store the accessories/cables/chargers once the box is tossed out are also great to have on hand. If you want it to look fantastic, and you have a label maker (which I do but never thought about using it for this), by all means go to it. This tip has helped to eliminate an ever-growing box of random cables and chargers that no one could remember what they went with. Throw the manuals (if there are any… these days…not so much) in there, too. This system is also helpful when you go to sell your electronics… value is higher if all original accessories are offered. And don’t forget to tuck a roll of garbage bags near the tree for all the (recyclable!) Christmas morning trash. 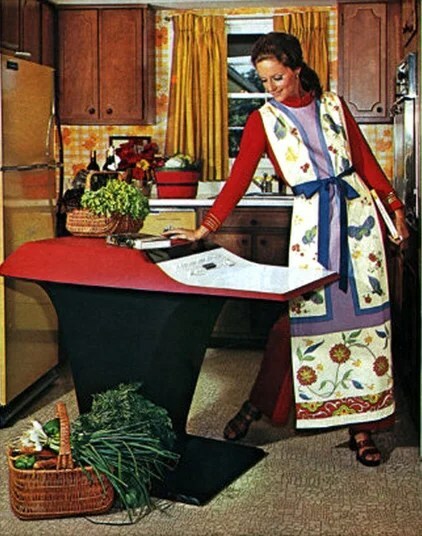 In 1969 it was actually possible to buy a futuristic-looking kitchen computer in the Neiman Marcus Christmas catalog. Yes…. December 21st, 2012 is the day that the Mayan calendar ends and, some say, so do we. Since there seems to be so many ways to kiss our a** goodbye I decided to spend more money and party hard.